Leading Chinese video site Tudou Holdings Limited has today announced the price of its initial public offering (IPO) of 6 million American depositary shares (ADSs) on the NASDAQ. The depositary shares (the equivalent to four Class B ordinary shares,) will be listed under the NASDAQ symbol TUDO and will be offered at $29 per share, for a total of $174 million. Credit Suisse Securities and Deutsche Bank are running the IPO, with Oppenheimer & Co acting as the co-manager for the offering. The Company has granted the underwriters a 30-day option to purchase up to an additional 900,000 ADSs at the initial public offering price, less the underwriting discounts and commission, to cover over-allotments of ADSs, if any. Tudou claims they are one of the world’s largest bandwidth users, moving more than 1 Petabyte per day to 7 million users, and sees over 50,000 new videos uploaded to the site daily. 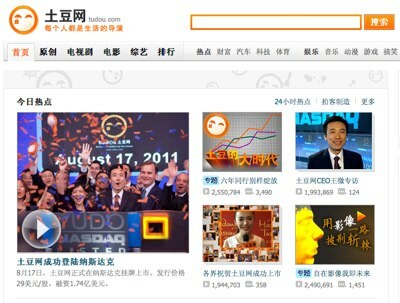 Although most of its traffic comes from mainland China, Tudou has also seen its international audience increase among the global Chinese community.